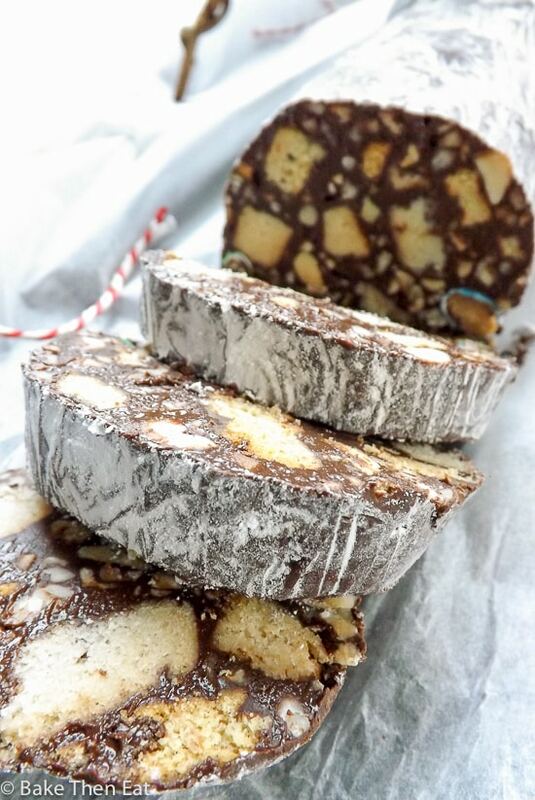 Today I am sharing with you a modern twist on an Italian and Portuguese classic treat – chocolate salami, Peanut Butter Chocolate Salami Cookies. Yep you read that right, as a true peanut butter lover I am always looking for ways to incorporate it into my food. 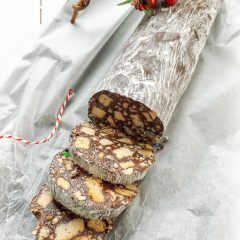 I love making chocolate salamis because they are so quick and easy to make, most of the time is inactive chilling time. But this is the first time I have added peanut butter to one and I love it ❤❤❤ Peanut Butter Chocolate Salami Cookies are definitely a great addition to any holiday cookie platter and they make a great last minute gift. So for those of you not in the know this is an easy thing to put together. Some broken digestives for my European friends or Graham crackers for my North American friends along with some broken up shortbread is mixed into a melted pot of dark chocolate and peanut butter. Then some additions chucked in for good measure, salted peanuts and some peanut butter M&M’s for a little more of a PB kick in these peanut butter chocolate salami cookies. Then roll it into a salami shape, wrapped in cling film / plastic wrap and popped into the fridge for a couple of hours or until set. Unwrap it and roll it in a little icing / powdered sugar to give it a real salami look. Roll it up in a little baking parchment and hey presto you have your peanut butter chocolate salami cookies all ready to go and be gifted to a friend. I have kept my add in’s pretty basic for these peanut butter chocolate salami cookies. I don’t think they need anything else, but you can jig them around to suit your needs. All shortbread could be used if digestives / graham crackers are either hard to come by or are just not liked. Reese’s Pieces candies could be used if the PB M&M ones are not easy to find. Cashews, almonds or pistachios could replace the peanuts. Try to use salted nuts as the salt goes well with the chocolate. Peanut Butter Chocolate Salami Cookies are a take on the Italian / Portuguese classic sweet treat. 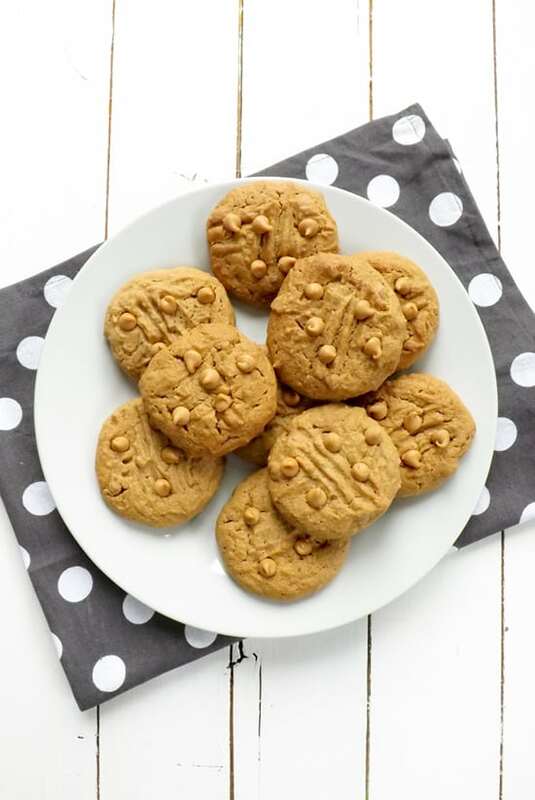 Packed full of crunchy cookies, sweet peanut butter candies and salty peanuts. Take your biscuits / cookies and break them into thumbnail pieces and place them to one side. 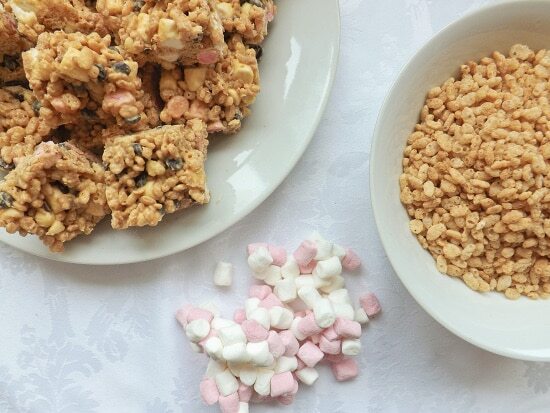 In a bain-marie, microwaveable bowl or a heat proof bowl over a small saucepan of simmering water melt your chocolate and peanut butter together. Once melted allow to cool slightly then pour it over the broken biscuits and gently stir until all of the biscuit pieces are lightly covered in the melted chocolate mix. Throw in the salted peanuts and peanut butter M&M's and very gently stir everything together. Tear off a large sheet of clingfilm / plastic wrap and lay it flat on your work surface and pour the chocolate biscuit mix into the middle. 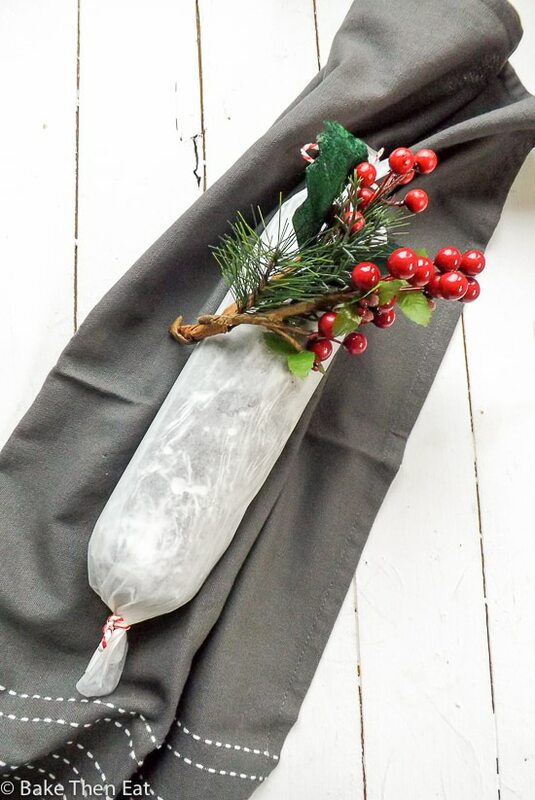 And with your hands mould it into a large sausage shape, wrap it up in the clingfilm and place on a flat baking sheet and place in the fridge for at least 2 hours or until set. Once set gently rub the icing sugar all over the surface to give it a real salami look, then wrap in baking parchment for an authentic look. To slice use a slightly warmed sharp knife. Kept in a tin in the fridge these peanut butter chocolate salami cookies will keep for at least 10-14 days. The cooking time is all inactive setting time. Gimme, gimme! I better not show this recipe to my husband! These chocolate salami cookies look so fun and frolic. This is SO fun!! Love the way you have used peanut butter & chocolate combo here. PS: Love your bright and pretty photos. OMG THIS IS INTENSELY AMAZING! I REALLY REALLY REALLY wanna make it! This is SO fun!! I’ve never made salami cookies and yours look perfect! Love the PB & chocolate combo! 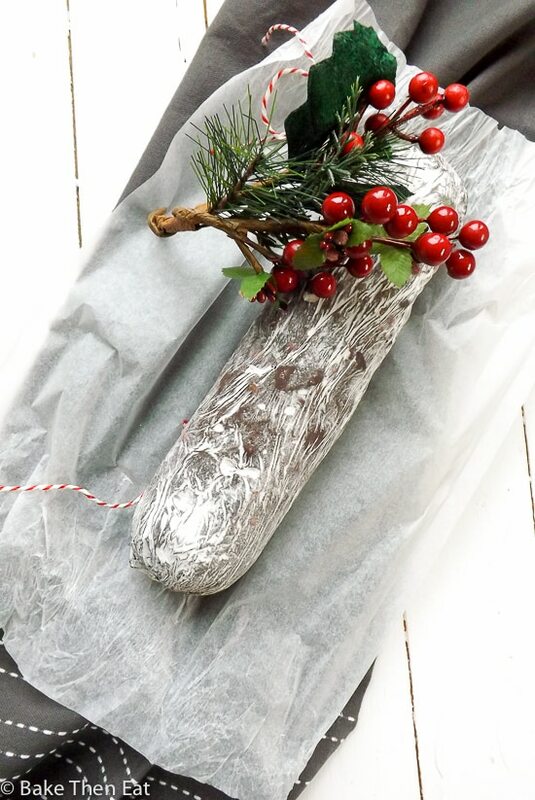 Now who wouldn’t love to receive one of these salamis for the holidays???!!! Your chocolate-peanut butter twist sounds amazing!!! Thanks Liz, it’s hard to beat a good PB chocolate combo! This is so fun! 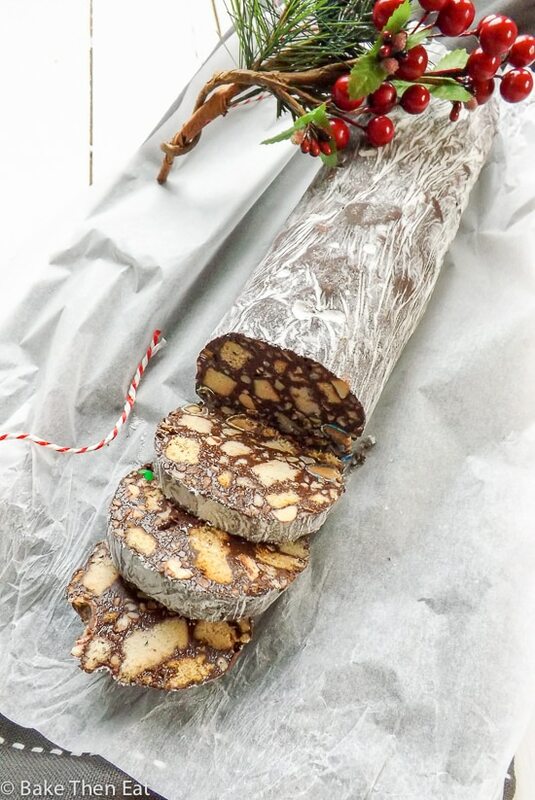 I like regular salami, but chocolate salami sounds way better. 🙂 And what a beautiful, unique gift to get! Emma, this is so GREAT and just like real salami!